Media planning, media buying, digital traffic management, client relations, digital strategy, CRM management...you name it, Kayla’s dabbled. Which is one of the reasons why she makes such a good project manager. But dipping her toes in a lot of areas is nothing new to Kayla. At Ball State University, she earned a Bachelor of Arts in advertising and picked up not one, not two, but three minors in marketing, Spanish, and sociology (all with an honors college diploma). It was all these disciplines combined that eventually led her to the agency life. 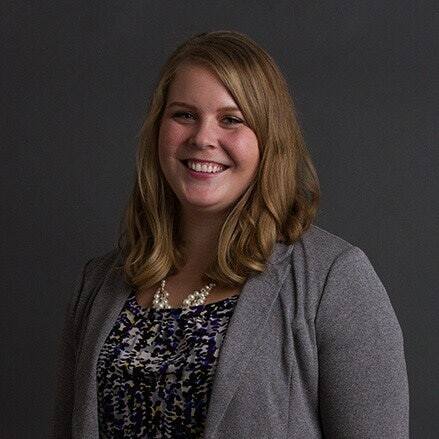 Since graduation, Kayla’s worked at multiple agencies in Chicago and Indianapolis, executing and planning top-notch projects for clients like the Indianapolis Motor Speedway, Sears, Kmart, Hefty, the Hoosier Lottery, and Cracker Barrel. Great project management means leveraging each person’s skills and responsibilities to accomplish the strategic objectives, and then crafting the most efficient roadmap to get there. When she’s not delivering awesome work to her clients, you’ll find Kayla on the advisory board for Women in Digital, or volunteering at the Humane Society of Indianapolis as a canine companion, taking care of large dogs looking for a home.